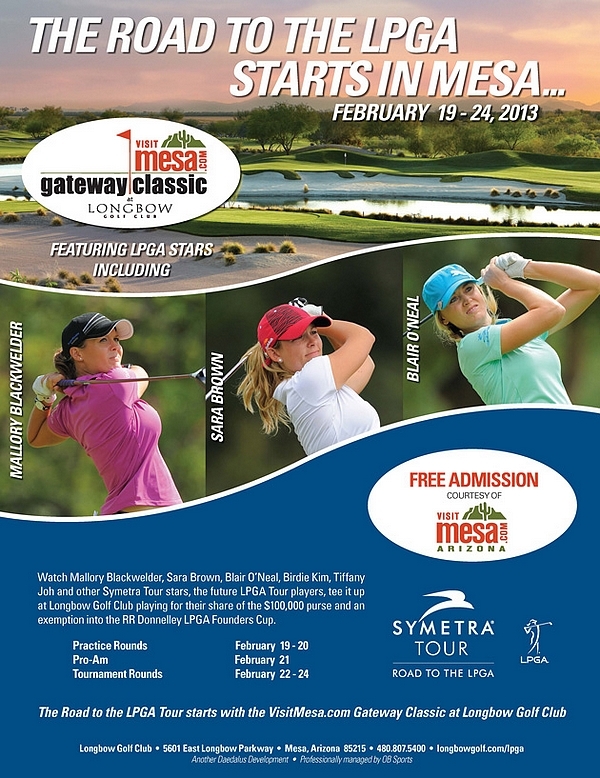 The Road To The LPGA Tour starts next week with the VisitMesa.com Gateway Classic to be played at the Longbow Golf Club, February 22-24! Compliments of Visit Mesa, admission is free for all tournament spectators. Watch Mallory Blackwelder, Sara Brown, Blair O’Neal, Birdie Kim, Tiffany Joh and other Symetra Tour stars, the future LPGA Tour players, tee it up at Longbow Golf Club playing for their share of the $100,000 purse and an exemption into the LPGA Tour’s RR Donnelley LPGA Founders Cup. The RR Donnelley LPGA Founders Cup will be played March 14-17 at Wildfire Golf Club at JW Marriott Phoenix Desert Ridge Resort & Spa. The RR Donnelley LPGA Founders Cup marks the first domestic event on the LPGA Tour’s 2013 schedule and gives the Symetra Tour winner an opportunity to compete alongside former winners of the event including Rolex Rankings No. 1 Yani Tseng and LPGA and World Golf Halls of Fame member Karrie Webb. The exemption into the RR Donnelley LPGA Founders Cup falls directly in line with the Symetra Tour’s mission of preparing the world’s best young women professional golfers for a successful career on the LPGA Tour. Since the Symetra Tour began in 1980, this season marks the second time the Symetra Tour will award 10 fully exempt LPGA Tour cards to the top-10 on the season-ending Volvik Race for the card.